I've got a solid lineup of cover music to share today. A few days ago Chris Carrabba from Dashboard Confessional released a 4-song covers album that spurred on this latest post of Cover Music Worth Covering. 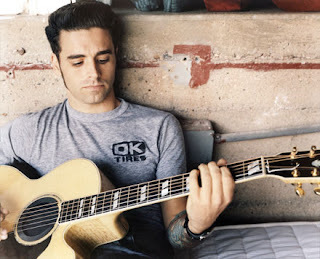 Chris Carrabba is one of my favorite acoustic performers. So I am always happy to hear that he has released some new music. His latest release titled "Covered in the Flood" is a covers album of 4 songs that I have never heard of before. As a matter of fact, I have never even heard of the bands that originally performed these songs. Cover songs or not, it is good music. You can download the songs using the widget below. The Coastals offer up a 7-song cover album featuring music from some more recognizable names. The American punk rockers pay tribute to a host of UK bands including The Beatles, The Clash, and Modern English as well as American influences Elliott Smith and The Shins. The production value for these songs is uncommonly high for a covers album and it's a good listen. Sample and download the songs with the widget below. Just came across these guys today. I know nothing about this groups original music, but it seems they have made somewhat of a name for themselves performing these cover songs a la Boyce Avenue. The link below provides a download of 20 songs of modern hits performed by the lead singer and guitar player. I love their punk rock music selections but unfortunately the production value is not that great on this download. All Time Low, Mayday Parade, The Maine, and more. One of my favorites is their cover of All Time Low's "Coffee Shop Soundtrack" shown below. Thanks for the heads up there. I checked it out and did notice that the link was not working for a while. Their servers were not responding to requests but it seems like the download widget is working just fine now. I will monitor it and try to find an alternative if the troubles continue.